I have been making this recipe for a few years now, but never got around to sharing it. 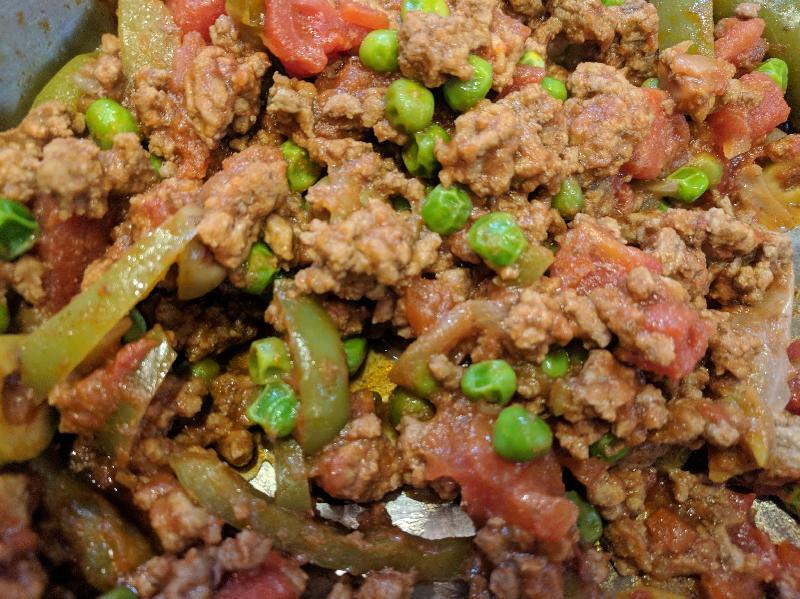 Ground Cuban Beef Hash I personally do not like to eat green olives, but find that I do enjoy them in this dish. 1. In a large skillet, cook the beef, green pepper, and onion over medium heat until meat is no longer pink. Drain the meat. Stir in the tomatoes, tomato paste, raisins, olives, vinegar, garlic, cumin, salt, and pepper. 2. Bring the mixture to a boil. Reduce the heat. Cover and simmer for 5 minutes. Then add the peas and cover Cook for 5 minutes longer or until heated through. Serve with rice. I also like to add some shredded cheese and sometimes sour cream.